It’s a scary statistic: the Animal Cancer Foundation (ACF) reports that 1 in 4 dogs and 1 in 5 cats will develop cancer in their lifetime. In fact, it’s the leading cause of death for dogs over the age of two. November is Pet Cancer Awareness Month, created by the ACF to raise awareness of the prevalence, symptoms, and treatments for cancer in our companion animals. Just as with people, the longer your pet lives, the higher their risk of developing some form of the disease. Some cancers have subtle symptoms or could appear simply as an enlargement or lump that a pet owner might attribute to aging. In many cases, those bumps may be a benign lipoma (fatty tumor), but it’s much better to be safe than sorry. Many types of pet cancers are treatable, but the earlier they’re caught, the better your pet’s chances of a good outcome. That’s why during the Month of November, AHSS is offering 10% off senior wellness blood work when you schedule an exam. 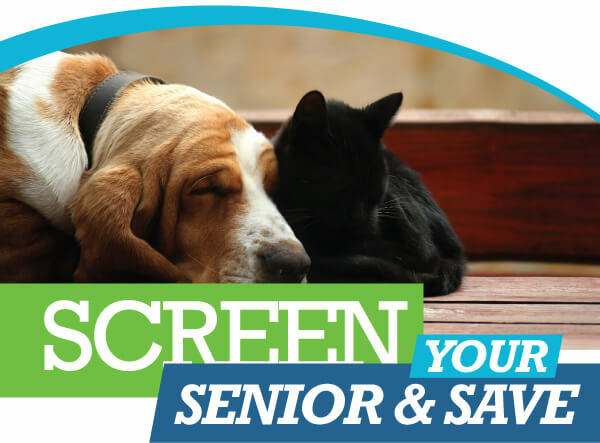 Not only will this testing screen for disease, but should your pet have a mass or condition that requires surgery, necessary blood work will already be completed for less. For more information on pet cancer or to schedule an exam for your pet, make an appointment online or call us at 470-991-2943. ← All A-Board for Holiday Travel!